Supreme Court Justice Sonia Sotomayor made a pit stop at the Harold Washington Library on Wednesday evening to speak about her new best-selling memoir, “My Beloved World,” one of the very few completely free events offered to the public, stated Mayor Rahm Emanuel in his introduction. The event drew a crowd of approximately 750 people, many of whom stood in line for tickets since 2 p.m. though the event began at 6 p.m. in the Winter Garden located on the ninth floor of the library. Hon. 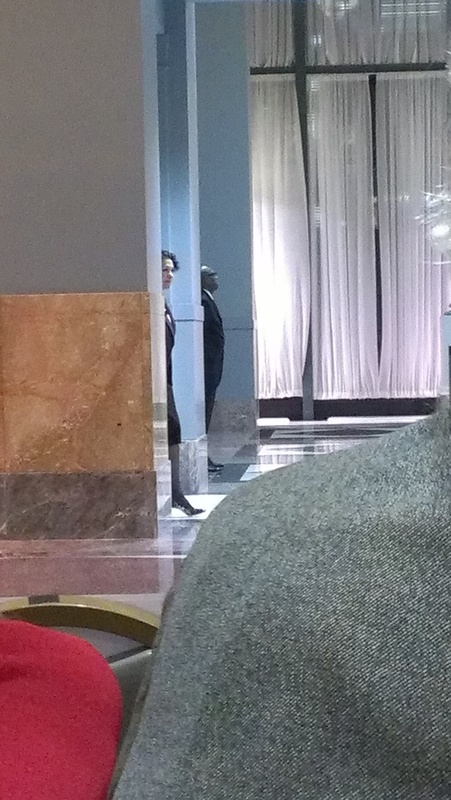 Sonia Sotomayor peeks out from behind the wall during Mayor Emanuel’s introduction. During her speech, Sotomayor talked about her life as a child, her relationship with her parents, overcoming challenges, taking risks and how she finds her center as a person with Type 1 diabetes. “She’s brought a heartbeat to the Supreme Court,” said the mayor. 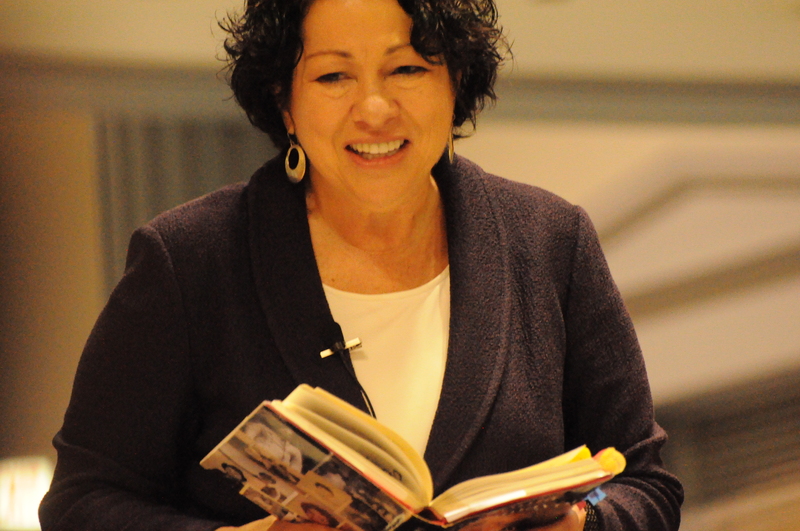 Sotomayor, 58, walked on stage thanking the public for attending the event and began by explaining how books, reading and libraries helped her get over her father’s death when she was a child. She then began discussing the process of writing her book and how her memoir was different than other justices’. “Just talking about the data of my life wasn’t going to touch people,” she said. In a radio interview with Maria Hinojosa from Latino USA, Sotomayor admitted that it was a question about her childhood from Hinojosa that got her memoir ball rolling. Another piece of advice she repeated: Ask for help. In an NPR interview she explained that she had done it various times while growing up and again while writing the memoir. 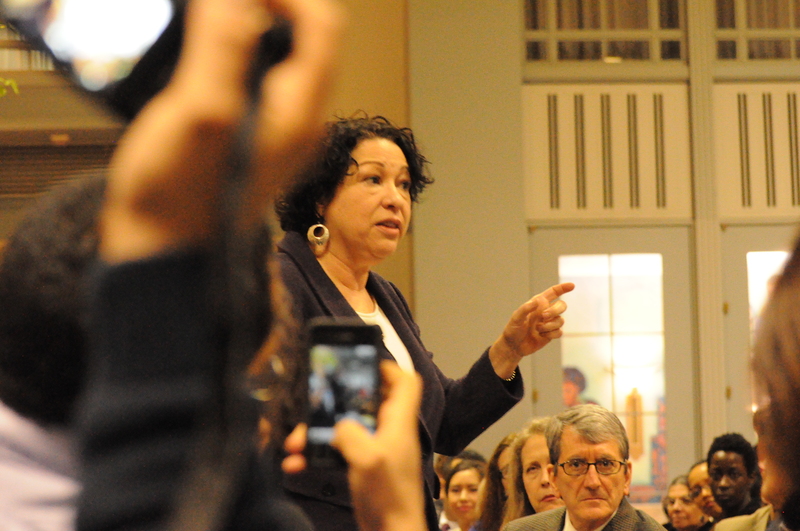 Sotomayor said she had various trusted readers and experienced writers giving her advice, asking questions and helping shape what this memoir has become. “Most of us fail at what we do because we don’t ask for help when we’re doing it,” she said. “I wanted the world to see my world,” she explained. Next Deception. Paris. 2 women. 1 man. A dog.